We meet most Saturday mornings, at 10:00 am and play lasts until 12:30 pm. 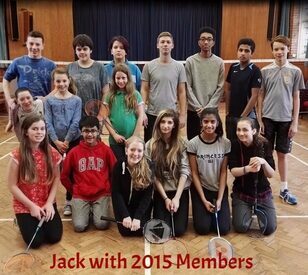 The Junior Club is a place where young people can meet from the ages of 10-17 and participate in various badminton games. For the members, is a friendly relaxed way of learning the game and channelling their energy. There is a mild amount of coaching but not too intense as to stop them enjoying their time on-court. Along with the normal single/doubles games, we also get everyone involved in other team games. It is just as much a social occasion. For the majority, it is hopefully 2+ hours of enjoyment and a chance to run around while using some of their excess energy. "This is an opportunity to connect not only with others of their own age but older and younger alike"
So if your youngster is within that age group, then bring them along to join in the fun. Even if they are only 9 years old, but are capable and able to play to an acceptable standard, then we are willing to try them out, in view to officially joining the club. Currently the standard is very good but we are always willing to take on newcomers to the game, if they show signs of an accepted ability.